âHEY! IT MAKES THE MUSIC WITH THE NOTES AND STUFF!â The Duke, aka Lucas Stangl, recently released an album co-created across the internet. 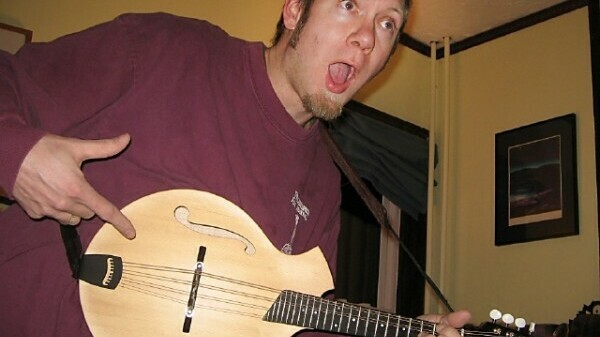 He loves his mandolin. The earliest incarnation of Coconut & The Duke equated to “Coconut” Joseph Maurer and Lucas “The Duke” Stangl jamming in a dorm 15 years ago. However, it’s unlikely anything they were doing at the time resembled their latest release, In the Bamboo Forests of Pennsylvania. The liner notes credit them with playing mandolins, guitars, basses, “Dukuleles,” accordions, keyboards, percussion, and singing vocals, not to mention that various friends make even further additions. In the Bamboo Forests is a peacock in comparison to six-string dorm sessions. Still, there remains that impromptu element. Coconut & The Duke create music largely by writing segments, swapping them online, and then building a garden salad. The band operates this way out of necessity. It’s only half-local. Coconut lives in Eau Claire and The Duke in Pennsylvania. This is all immediately apparent. The echoing guitar on opener Venison Jerky is staggered into timid hand-drums, claves, and earthly vocal harmonies that wonder: “where does the time go?” On the other hand, some of Bamboo Forests is well puréed. Venison Jerky melts away into the instrumental Intro before contorting itself again in the title track. Later on, Vitamin Y introduces, against all odds, a sax solo to a bouncing cabaret theme. Bamboo Forests’ discombobulation might also be attributed to the general absence of a drum kit played familiarly. Most of us are used to a prominent rhythm instrument adhering a song. And so, steering clear of the temptation to include some Buddy Rich wannabe, In the Bamboo Forests means to break popular rock norms. The duo cite eclectic mock-rockers Ween as an influence on their refusal to be just one band. Motel Maids moseys around with a southern darlin’ mandolin reminiscent of Blue Sky Boys. For prog fans, the duo wander the nearly eight-minute 3rd Night, letting the song “have a mind of it’s own” (as the mantric lyrics go) and entirely reinvent itself two or three times before ‘oommm’ing to a close. The Duke mentions that they grew up on folk and jazz, but there’s a surf song, a country ballad, a reggae tune and even a spaghetti western ode present on In the Bamboo Forests.